To start my blog, I thought I’d go to the heart of the matter and the social hub of London – Soho. In recent years, Soho hasn’t quite been the centre of cafe life that it should have been but things are changing. 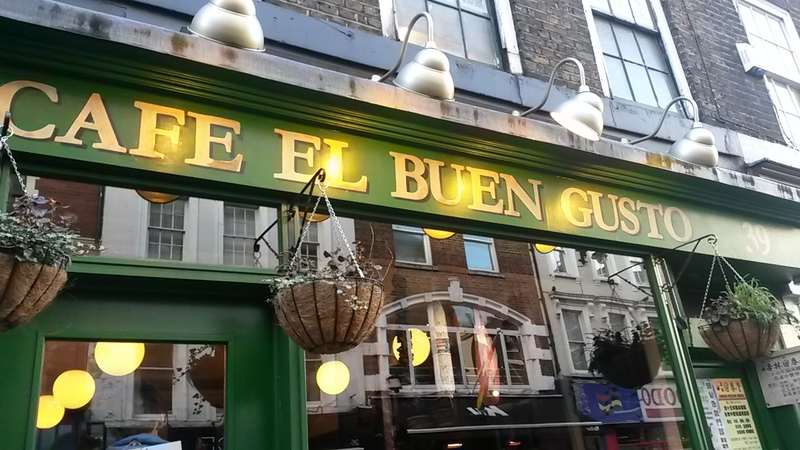 I decided to visit a little Portuguese cafe on Frith Street. This coffee here is what the ‘Bad News, Good News’ joke my Dad is so fond of was made for. The Bad News – its bland, tepid and uninteresting. The Good News – there’s lots of it. 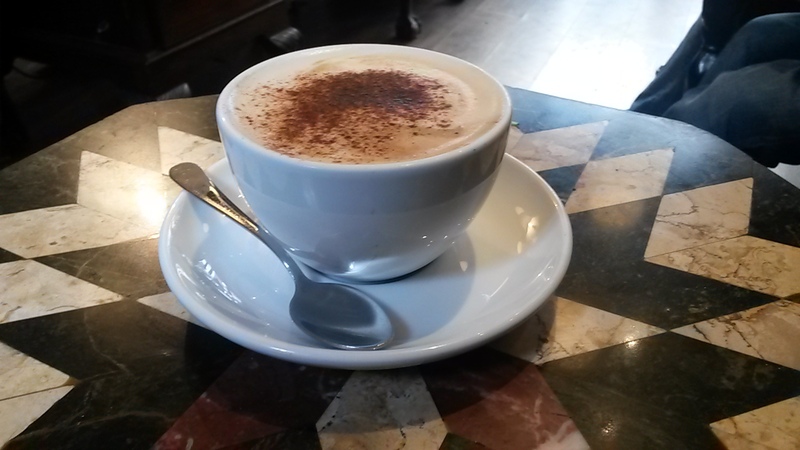 Like many modern chain cafes, they seem to think that a cappuccino means lots of milk. It doesn’t. While you do get a lot of ‘coffee’ for your money (a fairly large cup costs just £1.70), you can tell that most of the savings have been made by filling it out with milk. Also, it arrived at just above room temperature. I know that many baristas will tell you that these types of coffee are not meant to be served scolding hot – but warm would have been nice. Maybe I should have gone for the traditional Cortado, an espresso with a dash of milk. The fact that the coffee is so poor is a big shame as this tiny cafe has a great atmosphere. It feels like the kind of cafe you might actually find in a back street of Porto. With room for barely half a dozen people, lots of dark wood and tiles and Latin music playing sweetly in the background, I would have been happy to sit here imaging that outside was a traditional square somewhere in the Med, not a dirty street in Soho. 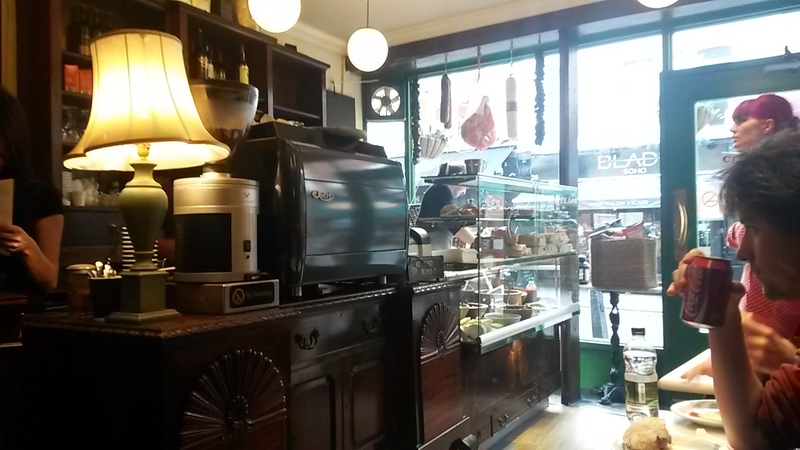 The owners and staff were stood behind the bar, chatting and laughing, welcoming customers with a warm ‘Good Afternoon’. With a selection of ridiculously cheap sandwiches on offer, this is the perfect spot for the hard up writer to grab a quick snack. Prices start at £2.50 and most sandwiches are £3.50 – a bargain. However, a bit of a warning to get there early. I’ve visited here in the past to be told that half the menu had sold out. Although the service was friendly, it wasn’t what you’d call top class. Considering there were only three people in the cafe (half full!) they managed to get my order wrong, leave dirty plates on my table until my coffee arrived and tried to give me a sandwich. Still, it had the feeling of a family run place and there was no bad-blood or annoyance when I told them they had got the order wrong. Nothing. The place is just too small to hang art works or stick a guitarist in the corner. Nice looking, cosy but fails to live up to its name.